U.S. Defense Secretary Jim Mattis, left, shakes hands with Indonesian President Joko Widodo before a meeting at Merdeka palace in Jakarta, Indonesia, Jan. 23, 2018. U.S. Defense Secretary Jim Mattis on Tuesday issued a strong rebuke of Turkey’s offensive against a U.S.-allied Kurdish militia in northern Syria, saying it is distracting from the fight against Islamic State militants. “The violence in Afrin disrupts what was a relatively stable area of Syria. It distracts from international efforts to ensure the defeat of ISIS, and this could be exploited by ISIS and al-Qaida,” Mattis told reporters in Indonesia. 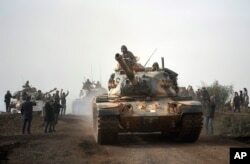 Turkey last week began bombing and has sent troops into northern Syria's Kurdish-controlled region of Afrin along the Turkish border, in an attempt to drive out the Kurdish People’s Protection Units, or YPG. “We urge Turkey to exercise restraint in their military actions and rhetoric and ensure its operations are limited in scope and duration,” said Mattis, who is meeting with his Indonesian counterparts in Jakarta. On Sunday, Mattis said Turkey, a member of NATO, had alerted the United States ahead of the attack. But at that point, Mattis did not criticize the Turkish operation. His tone changed Tuesday. “In the Afrin area, we had actually gotten to the point where humanitarian aid was flowing and refugees were coming back in. The Turkish incursion disrupts that effort,” Mattis said. 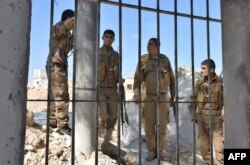 The YPG is a key U.S. partner in the war against the Islamic State group, and makes up a large portion of the Syrian Democratic Forces – a coalition that has forced Islamic State militants from virtually their entire so-called caliphate. But Turkey views the YPG as a terrorist group and accuses it of having links to Kurdish separatists. The U.S. decision to back the YPG has been a source of rising tension between Washington and Ankara, and Turkey this week repeated its calls on the United States to end its support of the militia.